"A Taste of New Season's Lamb"
Myself and a few other lucky bloggers (Thanh, Claire, Jackie, Neil, Elliot, Ed, Jess and Cam Smith from RRR) were invited along to Scott Pickett's first bloggers' event: "Beast on a Block", which was held last night at The Point in Albert Park. Scott is the executive chef at The Point, has his own blog, and as we discovered, is a really, really nice guy. I was greatly looking forward to the event, but not quite sure what to expect. The invite said we'd see a whole lamb get broken down (awesome! ), participate in a cook-off (scary!) and then have a meal (yay!). We started off with intros, drinks, and a chat about blogging and the restaurant scene. Then we were taken on a tour of the kitchen and meat fridges, with Scott talking us through how the kitchen is set up, and how he sources and hangs/ages the meat. 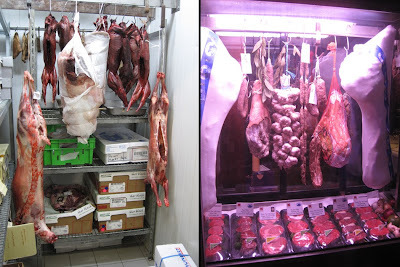 Left: small meat fridge downstairs.The bigger ones are lambs. The small dark ones are hares. Right: show fridge upstairs - lots of beef. Knives!! You will notice that the bottom knife is a Wusthof - my favourite brand of knife. The 2nd one from the top was bought in Kappabashi Kitchen Town! We also had Kumamoto oysters to nibble on as we watched. The lamb was quite young, 6-8 weeks, and was very small overall. I was actually amazed by how many different cuts he got out of the lamb. The little lamb chops and fillets were so cute! Below is the whole lamb broken down, after being brought into the kitchen. Vegetarians look away now. How cool does the crown-roast look! I'm not sure what the prawn dish is - it was an order for another table. Rather than getting us to participate in the proposed cook-off (which would have delayed the eating! ), Scott got us to jump into the kitchen in pairs, with each pair watching a different course get prepared. Thanh and I went in to watch the first course, and I scored an extra piece of confit flash-grilled king salmon, heh heh. We didn't get an actual menu; rather, each of us was given a list of the main ingredient in each course (e.g. king salmon, marron, pineapple etc. 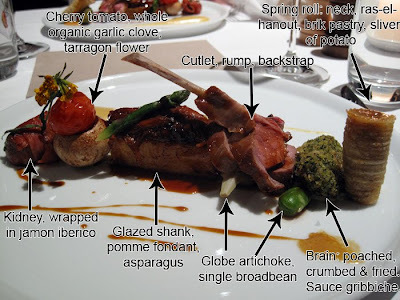 ), so that we could guess the ingredients and discuss the different components of each dish. Such a great idea. Let's go course by course. The following descriptions are from the notes I was hastily scribbling down during the meal. (It's not nerdy, we were all given notepads). Apologies if I've made any mistakes or missed anything out! "Confit King Salmon, Potage Parmentier and 3 different eggs"
The salmon (from NZ) was lightly cured in salt and sugar for an hour, then confit in grapeseed oil. The 3 eggs were soft-boiled quails egg, salmon roe and Osetra caviar (!!!). It was served with a quenelle of Meredith goat's curd, and a Chinese Lantern flower petal. I loved this course - the salty flavours of the salmon and caviar and the tangy goats curd worked so well against the mild-flavoured soup, which itself was rich and creamy. "Caramelised stuffed chicken wing, pumpkin gnocchi, emulsion of potato and black truffle"
Scott said the starting point for him creating this dish was the classic chicken & mushroom combination. The chicken wing (centre cut) was completely boned and formed into that small log shape, and topped with the potato/black truffle emulsion and a trompette de la mort (black mushroom). I thought the gnocchi was more like a blini than a gnocchi, and it had been crispy roasted. The black sauce was a field mushroom and butter puree, with squid ink for that dramatic black colour. Wow. "Butter poached Western Australian marron, foie gras parfait, brioche crumbs and sauternes reduction"
The black flecks on the marron are flakes of Cypriot black salt, and the small squares are apple jelly. More of those Chinese lantern petals too - aren't they pretty? I also enjoyed this course (I think by this stage we can safely assume I loved all the courses so I'll stop repeating myself), but I found the foie gras parfait a little rich, and could only eat about 3/4 of it (sorrrry!!!). It was great with the jelly and marron, but too intense to be eaten by itself once I'd finished everything else on the plate. The jelly was a wonderful touch, and really lightened up the dish. Elliot actually got a separate course, because the last time he visited The Point he'd ordered the marron. His kingfish and eel terrine was beautifully presented, but I will leave it for him to blog. You'll have seen this photo at the top of the post. But check it out... I've labelled it!!! (Yes, I'm a dork). This was absolutely gorgeously presented, and if you do happen to get down to The Point while the new season lamb is in (Spring usually), I wholeheartedly recommend you order it. I don't think I've ever had lamb this tender. I worked my way from the outside in, saving the lamb chop for last. Top: The organic single clove of garlic which was confit (or is it fondant?). It was very mild in flavour, and quite soft. The texture actually reminded me of potato. Middle: Sticky glazed tender lamb shank with fondant potato. Bottom: Crumbed brain. I didn't know what it was when I bit into it, which is probably a good thing, so there was no mental hesitation about it. It was very rich (not surprising, as one serving gives you 709% of your daily cholesterol needs), but surprisingly light and easy to eat. "Vodka and Cranberry Jelly, lemon and blood orange granita"
The green is basil foam, and the granita was made with San Pellegrino aranciata rosso and limonata soft drink. The pre-dessert was delightfully refreshing, but unfortunately I could only have a few spoonfuls as I was driving that night. Dessert was either pineapple or chocolate. At first I was hoping for chocolate, but once I tasted the pineapple, I was very, very happy. "Caramelised pineapple crumble, coconut cream and anise myrtle"
The pinapple is cooked 2 ways - one is blowtorched, the other is cooked sous-vide with 1 chilli, and then pan-caramelized. The clear jellies are ginger, and the tiny green leaves are lemon balm shoots. There were 2 tuilles filled with coconut foam, and the black dots are licorice "microdots", to give a hint of licorice flavour. There were also biscuit crumbs sprinkled over. I'm not entirely sure what the ice-cream was; I think someone at our table suggested it was yoghurt? "Valrhona chocolate and chestnut tortellini, coffee ice-cream and tonka bean foam"
No, I didn't have 2 desserts - this one was Thanh's. (Although I did steal one of his tortellini, heheh). The tortellini was filled with chocolate and chestnut, and was gorgeous! I didn't realise they would be soft (they looked like set dark chocolate to me), and it was a total surprise to bite into one, realise it was soft and have the filling come through as well. Beautiful. There were also pieces of caramelized pear, some pistachios, and a quenelle of chocolate-chestnut mousse. I've since learned that tonka beans are banned for consumption in the USA by the FDA, which makes this dessert even more badass. Some small bites to have with coffee. Not sure what the jelly on the left is. The pink one was a musk-flavoured marshmallow/meringue, and on the right was a salted-caramel chocolate. I was going to take just half of the salted-caramel chocolate, but I couldn't cut through it with my spoon, so I just *had* to take the whole thing. We also got wine with our courses, each carefully selected by The Point's somellier, but being such a wine-noob I can't remember exactly what they all were. I do remember we had a chardonnay with the king salmon, a German riesling (yay!) with the marron, a bordeaux with the lamb, a muscat beaumes de venise with the pineapple, and a pedro xeminez with the chocolate. Again, I was being a responsible driver so could only have a couple of sips of each. Note to self: Take a cab when going to a nice restaurant!! It was an absolutely brilliant night and a real treat. Not only was the food absolutely delicious, but Scott put so much thought into making it a really interesting and interactive event. It was lovely to catch up with the bloggers again too. I enjoyed the whole evening so much, I've already decided I'm bringing my family back for my birthday next year. FYI, I've looked it up, and a 7-course tasting menu at The Point is $95 PP ($155 if you get matching wines), which I think would be well worth it. Thank-you so much to Scott for organising and hosting this great event! Sarah dined courtesy of The Point, with thanks to Scott Pickett. I did something similar for the weekend of Sep 19/20 .I killed two 12-month old Damara /Wiltshire horn cross wethers .A completely different meat experience because of the age ,the size and the fat cover .Mine cut out 30kgs of meat per body .They have a strong almost muttony flavour and were magnificent when dry aged .The legs ,loins and racks were left whole in roasts ,and the shoulders and necks boned and rolled with a prune and cognac stuffing ,and a fetta ,kale and pinenut stuffing . Three legs and three shoulders were cooked in our outdoor oven and fed 42 guests ,after a simple ravioli and spring veg soup. My boast is that I grew ,made or raised everything myself ! Oysters taste good when they are eaten raw and fresh from catch! They got this appetizing taste. It was great night and I'm definitely going to go back for another meal soon. Great write up Sarah, even with my scribbling pad, I didn't capture half the ingredients in the dishes. It must have been from the wines I was continuously drinking all night. WOW, looks like amazing night. I approve of anything butter-poached :) That food sounds very, very intense but also lots of fun. Daniel - I know, I was in shock at how good everything was. Green Acres - Nice one!!! I'm very impressed. baby furniture - I love raw oysters too! I can't handle Kilpatrick or Mornay, ewwww. Belle - Thank-you! I must admit I felt a bit sorry for the lamb too, lol. Laura - When I look back at it the food looks very cheffy, but when we were eating, it just seemed like good good food. Penny - It was so interesting to see the lamb get broken down. Definitely gave me a new appreciation for the butchers' craft! Wow! Where is this? I must got o this place! The foods are so tempting and I haven't eaten oysters for years! Wah I'm amazed that everyone's doing black truffle and chicken (learnt of the idea recently from MasterChef). OH how I love foie gras!